Urban Ecology and Mission Housing Corporation instigated the redesign of the 16th and Mission Street BART station plazas to reclaim what was dysfunctional public space. 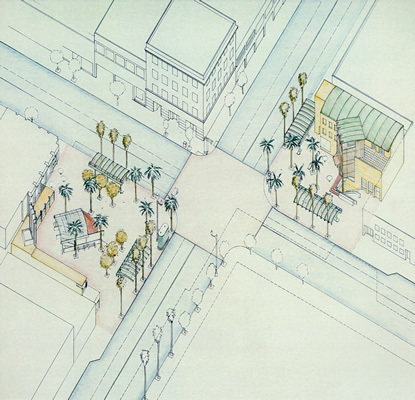 The existing plazas were built without regard for the visibility, comfort, or continuity to the surrounding urban fabric. Through a series of three design workshops, the Community Design process served to understand the issues surrounding the space; as a means of generating diverse ideas; and act as a catalyst for obtaining momentum and funding for the implementation. As well as transit hubs, the plazas served many uses for a diverse constituency, most importantly, as open space for an area lacking parks or open space. The new plaza opened in the Spring of 2003 and received the 2003 Beautification Award from San Francisco Beautiful.